Don't write this modified Tele off as a rock beast. It'll do country, blues, jazz… you name it. Warm-sounding pickups with plenty of edge. Cool looks. A five-way switch would be nice. This guitar will handle everything from country to full-throttle rock. The maple fingerboard contributes to a lovely, bright sound. The Strat-style body contouring will appeal to those who find the usual slab body uncomfortable. There was a time when Fenders had single-coil pickups and Gibsons had humbuckers, and people were okay with that. You paid your money, took your choice. Then hard rock happened and suddenly everyone wanted more power from their pickups. By the early 1970s, the chisels were out and humbuckers were in, no matter what you played. Fender got the message and released the twin humbucker- equipped Tele Deluxe and Thinline in 1972. "The neck on the Telecaster HH has a slim 'C' profile that should find favour with most players." Later in the decade, tinkerer extraordinaire Edward Van Halen drove the point home by forcing a humbucker into the bridge position of a 'Strat-style' body and, well, the rest is history. The legacy of that early tonal cross-fertilisation can be seen in these new Fender Blacktop guitars. The range consists of four classic Fender models - Telecaster, Stratocaster, Jazzmaster and Jaguar - each modified with humbucking pickups and a bunch of other features that include bolt-on maple necks with a gloss urethane finish, a 241mm (9.5- inch) fingerboard radius, medium jumbo frets and 'skirted' amp-style knobs. The fact that the Blacktop Series is being marketed with downloads of sticker designs and stencils is a good clue to the type of player Fender is hoping to snare with this range. Young punk, metal and indie guitarists who wouldn't have considered a Fender as 'their thing' but might be tempted by the extra firepower on offer. The Telecaster HH has an alder body with Strat-like contouring at the rear to help the guitar rest against ribs, or beer belly - whichever it hits first. It also features a six-saddle fixed bridge with through-body stringing and a control plate that appears to have been put on upside-down. This has become a common mod for Tele nuts looking for better access to the volume and tone controls. Advocates also reckon that flipping the controls prevents accidental contact with the pickup selector switch while playing. Many of you will no doubt prefer Leo Fender's original design, but it's all down to personal preference and certainly not a deal-breaker. The Tele has a three-way pickup selector switch for the usual bridge only/neck only/ both pickups on arrangement. We think Fender has missed a trick by not fitting a five-way switch on the Tele as it did with the Strat, it would have made it much more versatile. We took a closer look at the pickup wires and they're not four-conductor, so you can't modify the stock pickups to split the coils. Pity. The neck on the Telecaster HH has a slim 'C' profile that should find favour with most players. Like the other guitars in the range, it comes fitted with a set of Fender Super 250L (0.009-0.042 gauge) strings. The guitar was set up perfectly straight from the box. Heavier strings would be good, but that's a personal choice. Playability is uniformly excellent, with a comfortable action and easy string bending right up to the top frets. It covers a lot of ground tonally. The neck 'bucker on both guitars offers a warm jazz tone with bags of clarity and little evidence of the muddiness that can afflict similar spec guitars. The Tele gives an excellent account of itself, offering good depth in the bridge position. Despite its humbucker-based arsenal, it excels when attacked with some country licks. The bright snap of the maple 'board combined with the beef of that bridge humbucker really works well with pedal steel licks. It reacts well to heavy-duty filth, too - if you think you need a pointy rock guitar to make eardrums bleed, think again. It would be great to see a hardtail version of the Strat added to the Blacktop range - we reckon it would be pretty special. Some will see the Blacktop Series as a cynical marketing ploy designed to squeeze a bit more juice out of some very well-established designs. 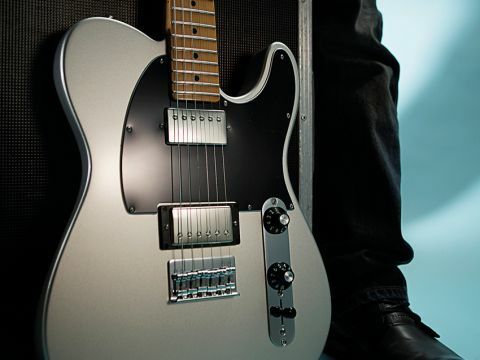 We did wonder about that, but what we discovered was an excellent guitar: the Tele represents one of the best instruments to come out of the Fender factory in Ensenada, Mexico. The build quality, playability and tone on offer are fantastic for the asking price. There's no doubt that Fender is hoping to win some new fans with the Blacktop Series. That may or may not happen, but there's also something here for existing Fender fanatics. The addition of humbuckers hasn't diluted what makes this classic Fender design great; instead, it's thrown up a bunch of great new tones. The gene-splicing experiments that tone fiends inflicted on innocent guitars back in the day are now available as standard. And that means the chisel can stay in the toolbox where it belongs.